The simplest method to wash the grime off your RV: take it to a car wash with a big bay! The easiest way to clean your rig is to pull it into a car wash that has an RV bay and go for it. But sometimes car washes with RV bays are hard to find, and moving around on a ladder to get to the high spots is tricky. If you boondock all the time, like we do, and don’t stay in RV parks and don’t ever go home to a house with a driveway and hose, you also don’t have access to handy water spigots. So Mark has found some creative ways to keep our rig clean while boondocking. For a quick job on the truck — if it’s just dusty and not dirty with caked-on mud — he likes to use Turtle Wax Foam Away, a dry wash that doesn’t require water. Spray it on and wipe it off, and your truck is nice and clean. Sadly, this product isn’t available any more, but another great alternative is Dri Wash ‘n Guard Waterless Car Wash.
For more stubborn dirt and stains, like the bugs that splatter on the front cap of the fifth wheel and the hood of the truck, or for a more thorough wash, Mark makes up a bucket of sudsy water using a couple of gallons of water and Turtle Wax Zip Wax Ultra Concentrate. He washes down one area at a time and then wipes it dry. No rinsing necessary. The neat thing about boondocking is that you have tons of space around your rig, so he drives the truck around the fifth wheel, lining it up to reach the highest spots on the trailer. A ladder works too, but the truck gives him a much wider lateral reach as he walks along the side of the truck bed. It’s a little acrobatic, but that’s makes the job more exciting! 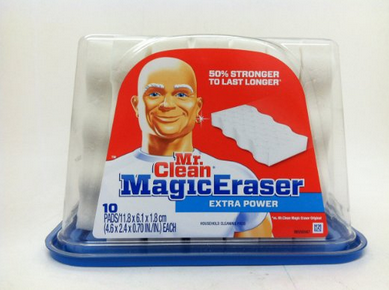 One awesome product Mark discovered is Mr. Clean Magic Eraser Pads. These things do an amazing job of getting rid of the scuff marks on the fiberglass front cap on our fifth wheel. 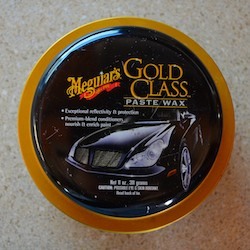 For quick waxing he prefers Meguiar’s Quik Detailer (others like Mr. Clean’s Spray Wax work too). This is a polish detailer that gives the truck and trailer a nice shine and leaves the fifth wheel front cap and truck hood so smooth the bugs don’t stick (at least not for a while). To get a little UV protection on rubber seals and plastic (like the translucent plexiglass hatch covers, a/c unit and fridge vent) he uses Protect All, a UV protectant. He has also used 303 Aerospace Protectant, which seems to work equally well. And of course the truck windshield gets a dose of Rainex every so often. Rainex makes rain on the windshield bead up and slide off more easily so the wipers can be used a little less — although we’ve found it seems to be most effective at preventing rain from falling all together, that is, until the Rainex has worn off and the windshield needs another coat! Once a year Mark uses Meguiar’s Gold Class Paste Wax on the both the truck and trailer to give them a deeper finish and prevent oxidizing. If there is oxidation or stuck on bug pieces that just won’t come off, he uses Meguiar’s Cleaner Wax, a cleaner/polisher that has a mild abrasive in it. Over the years Mark has tried lots of different cleaning and polishing products, and they all get the job done. Far more important than using a particular product is just getting out there and applying some elbow grease with whatever you have on hand. Doing a little bit more frequently is easier than doing a big job all at once…! 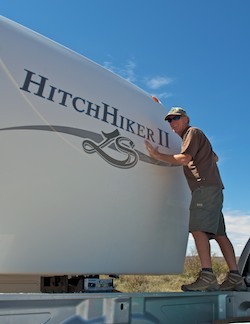 When the rig just needs a quick dusting (the truck especially), Mark turns to his trusty California Duster. 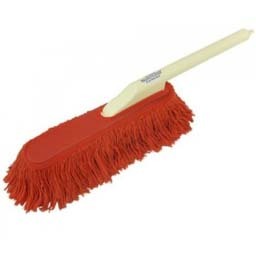 This thing is amazing because it picks up all the dust and can later be shaken out with a few quick twists of the wrist. And that’s all there is to it. Easy peasy — especially for me, since on those rig washing days I always find I am suddenly very busy doing something else!! And, ironically, after each of the photos of our buggy getting a bath on this page was taken — in a car wash in Montana and while boondocking in Colorado — it rained for 3 days in each place. So go ahead — do the RV rain dance and help end the drought!! New to this site? 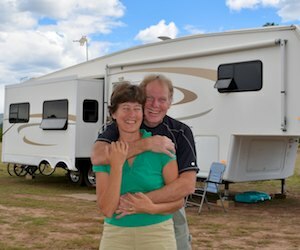 Check out the RVing Lifestyle and Tech Tips in the MENUS at the top of the page for detailed info about installing solar power, installing a vent-free propane heater, living the full-time RV lifestyle, how to go boondocking, how to find free campsites, the costs of full-time RVing and more. Please visit our Home page and Welcome page for RVers to learn more about us and discover all the other good stuff available to you on this blog.